I love apple pie. 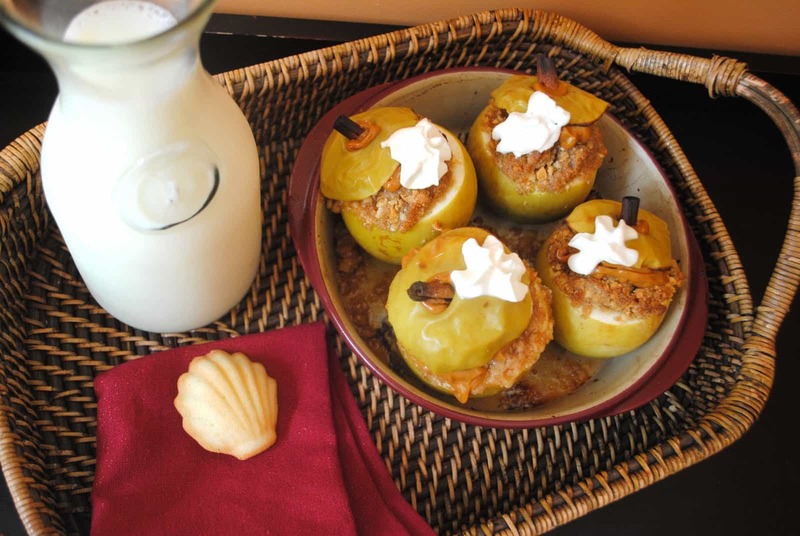 There is no better way to ring in the Fall than with an apple dessert baking in the oven. The aroma through the house was amazing. Being that we are now in September, I thought apples are the perfect dessert. Does it matter that it’s 90 degrees outside still? Nope, just turn down that air conditioning until you are chilly! 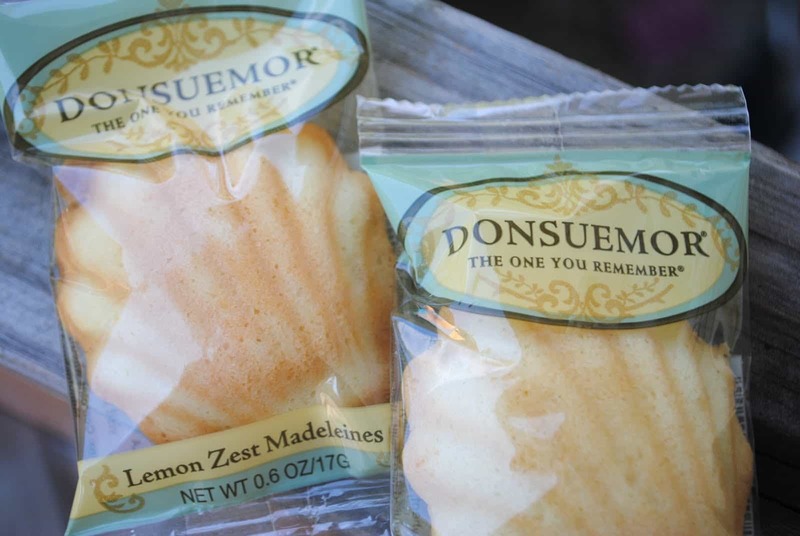 I was recently invited by Donsuemor to sample a box of their cookies and create a seasonal recipe using their products. One of the first things to come to mind was to make something with apples! I received two types of treats from Donsuemor, lemon zest madeleines and chocolate madeleines! Now, I have to be honest here, I had never eaten a madeleine prior to these. But, OMG these are amazing. The lemon ones are so buttery and, well, lemony. I knew immediately I would be pairing these with my dessert. The chocolate ones, well, they are gone, eaten, and enjoyed. I wish I had saved them because they would have made a great dessert with peppermint! 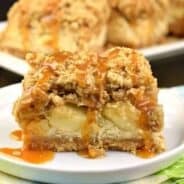 The baked apples with the lemon streusel and the lemon infused caramel sauce are absolutely divine. I hope you enjoy them as much as we did here! Thank you Donsuemor for a great product! You can send me more anytime! 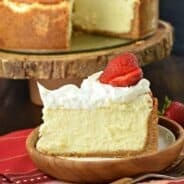 Donsuemor is celebrating national dessert month this October by featuring a “Dessert a Day.” So, without further ado…here is my recipe for all of you! Enjoy! Be sure to “like” them on facebook and tell them I sent ya! Cut top of apples off, set aside. Core apple and using a paring knife cut the top of the apple a little wider so you can fit more stuffing inside. Repeat for all the apples. 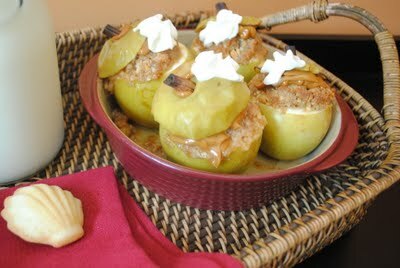 Put apples in small baking dish. Cut lemon in half. Juice half the lemon and drizzle the lemon juice all over the insides of the apples (to help prevent browning). In a bowl, add butter, brown sugar, cinnamon and madeleines (or pound cake). Use hands to mix and combine butter throughout streusel. Will be crumbly! Stuff each apple with the streusel by pressing the mixture into the core with fingers. Use remaining streusel to top each apple, pressing firmly. Return top of apple and stick half a cinnamon stick through the center to hold it in place (will also look like a stem). Bake apples, uncovered, in a 425 degree oven for 15 minutes. While baking, make caramel sauce. In a mixer combine dulce de leche with juice from half of a lemon. Beat for two minutes until creamy. Remove apples from oven, immediately drizzle with caramel sauce. Top with whipped cream and enjoy warm! Looks and sounds delicious; what a great idea 🙂 I can see myself making this in the fall and having the wonderful smell throughout the house! Oh my goodness, these look gorgeous! The presentation is really beautiful. I would love it if you would share this post at Freestyle Friday at Happy Hour Projects. Oh man, those sound good. What a great idea for a dessert. 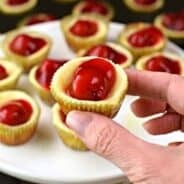 Thank you for linking your wonderful recipe to Fat Camp Friday. I would also love for you to join my new forums and link up your website and any linky parties you host! Have a great weekend! These look WONDERFUL!!! I will HAVE to try them for sure. I love your blog and also want you to know that I’ve awarded you the Versatile Blogger Award!! You can to my site, The Big Green Bowl to find out more about it and what to do next. Congratulations! Oh yum! Perfect for all of those apples on season now. LOOKS GREAT!!!! I MADE A RECIPE WITH THEIR COOKIES, TOO! SO FUN-RIGHT?! These look so yummy! I would love to give these a try. Makes me wish Fall were here already.